Ch. i.: Whatever is edible, and is private property, and grows in the ground is subject to tithe. Plants that are edible while young as well as when full grown are subject to tithe before maturity (if any part of the crop is taken before maturity); but of plants that are not properly eatable before they reach a certain stage of ripeness one may eat, without separating the tithes, until they develop. 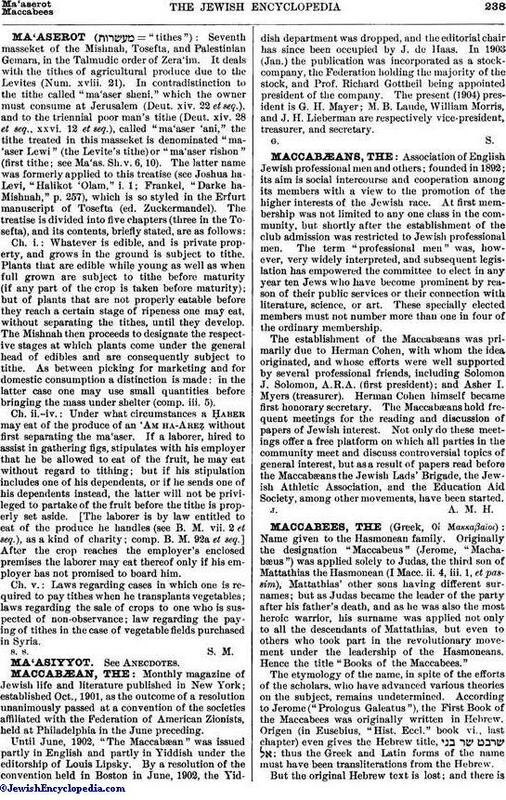 The Mishnah then proceeds to designate the respective stages at which plants come under the general head of edibles and are consequently subject to tithe. As between picking for marketing and for domestic consumption a distinction is made: in the latter case one may use small quantities before bringing the mass under shelter (comp. iii. 5). Ch. ii.-iv. : Under what circumstances a Ḥaber may eat of the produce of an 'Am ha-Areẓ without first separating the ma'aser. If a laborer, hired to assist in gathering figs, stipulates with his employer that he be allowed to eat of the fruit, he may eat without regard to tithing; but if his stipulation includes one of his dependents, or if he sends one of his dependents instead, the latter will not be privileged to partake of the fruit before the tithe is properly set aside. [The laborer is by law entitled to eat of the produce he handles (see B. M. vii. 2 et seq. ), as a kind of charity; comp. B. M. 92a et seq.] After the crop reaches the employer's enclosed premises the laborer may eat thereof only if his employer has not promised to board him. Ch. v.: Laws regarding cases in which one is required to pay tithes when he transplants vegetables; laws regarding the sale of crops to one who is suspected of non-observance; law regarding the paying of tithes in the case of vegetable fields purchased in Syria.